[314 Pages Report] The top 10 advanced materials & technologies in electronics report cover the emerging products in the electronics domain. In this study, 2015 has been considered the base year, 2016 to 2021 as the forecast period to project the market size of each advanced material & technology. Each of the product in the top 10 advanced materials & technologies market is led by various players who dominate their respective area. Few of the players in the top 10 advanced materials & technologies are Broadcom Ltd. (U.S.), Sckipio Technologies SI Ltd. (Israel), QD Vision Inc. (U.S.), Nanosys Inc. (U.S.), Samsung Electronics Co., Ltd. (South Korea), STMicroelectronics N.V. (Switzerland), Graphene NanoChem Plc (Malaysia), CVD Equipment Corporation (U.S.), Renesas Electronics Corporation (Japan), Toshiba Corporation (Japan), TSMC Ltd. (Taiwan), Universal Display Corporation (U.S.), BASF SE (Germany), Arkema S.A. (France), Hanwha Chemical Co. Ltd (Korea), and others. This report categorizes the global top 10 advanced materials & technologies in electronics market based on product. Each of this product is further segmented by different parameters. The top 10 advanced materials & technologies in electronics market includes high growth materials & technologies in the electronics domains such as G. fast chipset, quantum dots, graphene, 3D IC & 2.5D IC packaging, organic electronics, flexible battery, carbon nanotubes, biochip, silicon carbide in semiconductor, and smart glass. G. Fast Chipset is estimated to be the fastest-growing technology in the electronics domain. The G. fast chipset market is projected to grow from USD 41.0 Million in 2016 to reach USD 2,966.7 Million by 2021, at a CAGR of 135.4% from 2016 to 2021, due to the growing demand of ultrafast broadband services and lower cost of deployment. Also, the growth of 4K TV and increased competition among the broadband service providers in developed countries is expected to provide a significant opportunity for the G. fast technology. Apart from this, factors such as supportive government policies to meet national broadband plans, and faster speed of G.fast technology over shorter copper length are helping the G. fast chipset industry to grow rapidly in North America and Europe region. Quantum dots is one of the fastest-growing material market in electronics domain. The overall market size of quantum dots is expected to reach USD 7,679.7 million by 2021 at a CAGR of 63.4% during the forecast period. The market is driven due to its superior performance and resolution quality. Moreover, the QD technology is flexible and versatile; it can be applied in numerous fields such as medical, optoelectronics, and solar energy and can also be used in the defense and security applications. Flexible battery is fastest-growing material in electronics. The market for flexible battery was valued at USD 69.6 million in 2015, and it is expected to reach USD 615.4 million by 2021, at a CAGR of 44.9% during the forecast period. The growth of this market is being propelled by the growing demand for wearable electronics, rising demand for thin and flexible batteries in electronic devices, and increasing miniaturization of electronic products. This market has several opportunities that the existing and entry level companies can explore to expand their businesses. The global graphene market is expected to grow at a CAGR of 42.8% in terms of value during the forecast period. Graphene is used in various industrial and commercial applications such as composites, coatings, and energy among others owing to its tensile strength, flexibility, and non-toxicity nature. It holds the potential to be used as a substitute for incumbent materials in various applications such as transport and automotive, environmental and health applications, and information and communication technologies. The demand of graphene has experienced exponential growth over recent years, due to its broad array of unique properties and environmentally friendly approach. 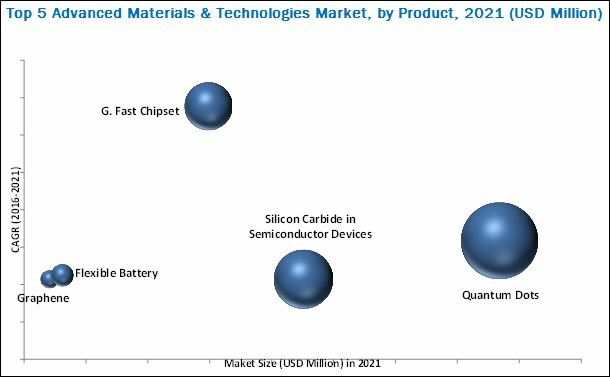 The Silicon Carbide (SiC) in semiconductor devices market is experiencing radical changes because of the continuous development of technologies. The Silicon Carbide material is superior in properties such as hardness, strength, shock resistance, and thermal conductivity. 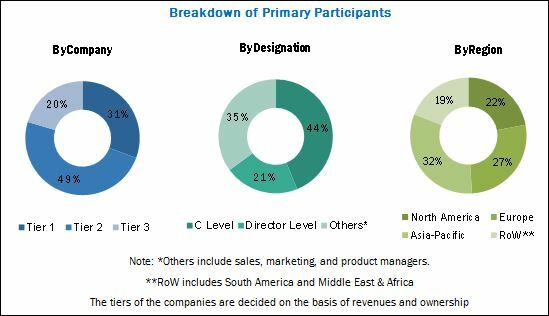 The SiC in semiconductor devices market is projected to grow from USD 537.6 million in 2015 to USD 4,520.7 million by 2021 at a CAGR of 42.8% during the forecast period. The growth can be attributed to its ability to perform in high temperature, power and frequency, growing demand in the solar power market, and huge demand for high resistant material and high voltage power semiconductor application. 4.7.2 Sckipio Technologies Si Ltd.
6.7.1 Samsung SDI Co., Ltd.
9.7.2 Samsung Electronics Co., Ltd.
11.9.2 Hanwha Chemical Co. Ltd.
13.7.1 Thermo Fisher Scientific, Inc.
14.1.3.4 Blue Spark Technologies, Inc.
14.1.3.7 NEC Energy Solutions Inc.
14.1.3.8 Rocket Electric Co., Ltd.
14.1.3.9 Guangzhou Fullriver Battery New Technology Co., Ltd.
14.1.4.4 2D Carbon Tech Inc., Ltd.
14.1.4.6 Thomas Swan & Co., Ltd.
14.1.6.6 Hyperion Catalysis International Inc.
14.1.6.19 Thomas Swan & Co. Ltd.
14.1.7.3 Asahi Glass Co. Ltd.
14.1.7.5 Hitachi Chemical Co. Ltd.
14.1.9.3 Chunghwa Telecom Co., Ltd.
14.1.9.8 Marvell Technology Group Ltd.
14.1.10.2 Fairchild Semiconductor International Inc. Figure 19 SWOT Analysis: Sckipio Technologies Si Ltd. Figure 22 SWOT Analysis: QD Vision, Inc.